Valentine's Day always sneaks up on me except for this year. My decorations went up in the classroom and the house 2 weeks ago and I have been adding hearts to the kids doors every day stating something I love about them. They enjoy reading them in the morning and sometimes leave notes back to me on the heart I left them. It is very cute and I already know what I am getting them, I just need to pick it up. 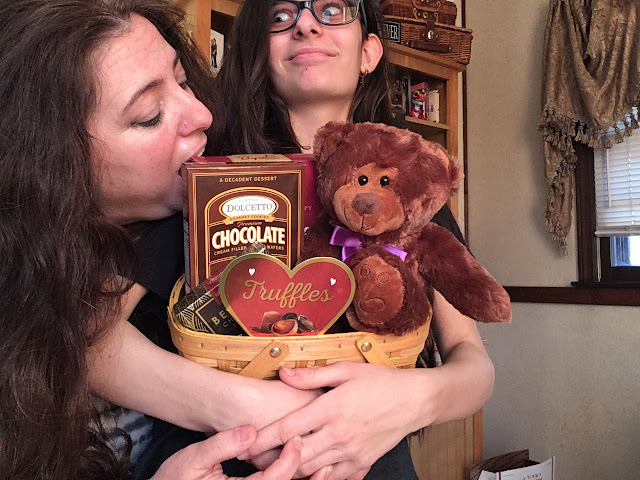 Hopefully, something special will come my way from the family but if not Gourmet Gift Baskets.com has already given me the sweetest gift basket perfect for Valentine's Day. They have so many to choose from ranging in price from $19.99 and up. 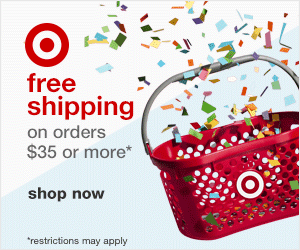 Some even have shipping included. 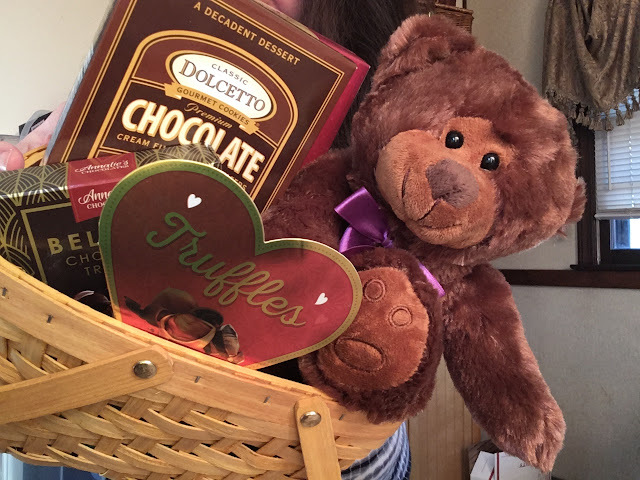 The Teddy Bear & Chocolate Valentine's Gift Basket that was sent to me did. Teddy Bear - This soft and sweet-faced teddy bear is made from perfectly plush fabric and adorned with a purple bow. 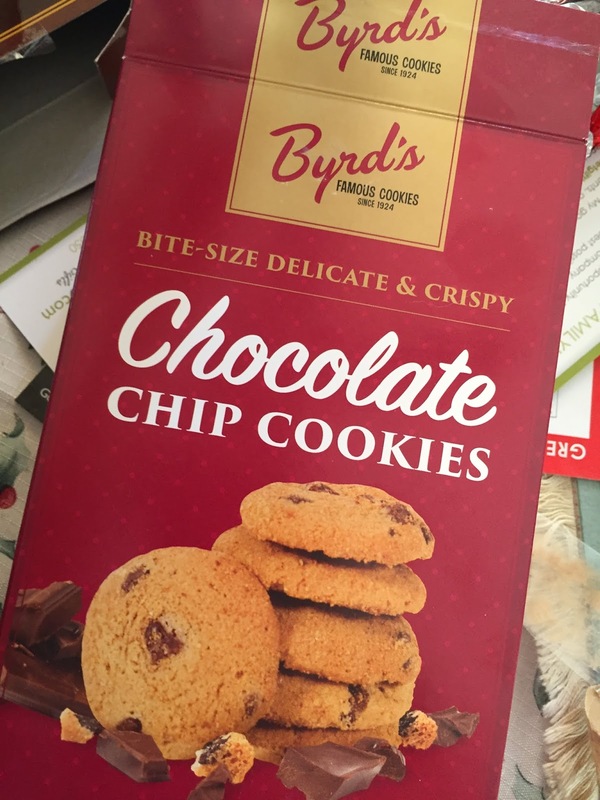 Chocolate Chip Cookies by Byrd's Famous Cookies - 4 oz. - Rich, crispy, buttery cookies are laced with melt-in-your-mouth chocolate chips. 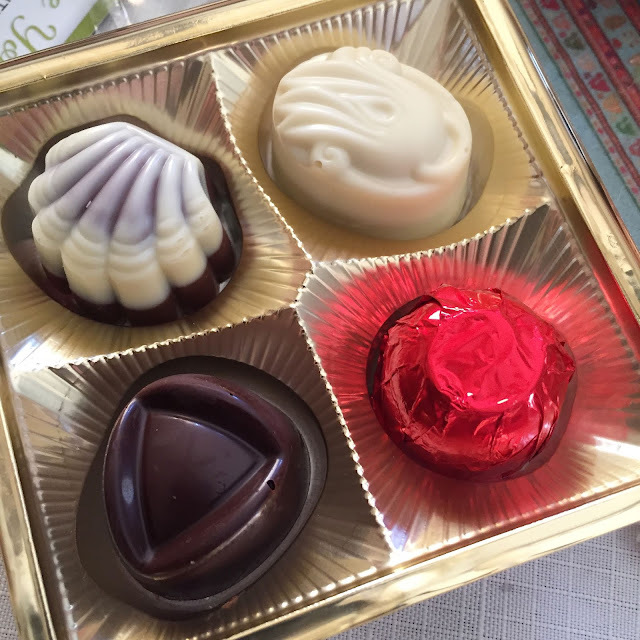 Belgian Chocolates by Annalie's Chocolates - 1.76 oz. - Decadent chocolate truffles with flavorful centers and a crisp chocolate shell. Chocolate Wafer Rolls by Dolcetto - 4.4oz. - Pillow-shaped all-natural crunchy cookies stuffed with a rich chocolate cream. Chocolate Hazelnut Truffles by GourmetGiftBaskets.com - .8 oz. - Ganache infused with hazelnut covered in smooth milk chocolate. Goddess and I love the basket. We thought the bear was adorable with it's little paw prints on the bottom. It was squeezably soft and not too big or too small. 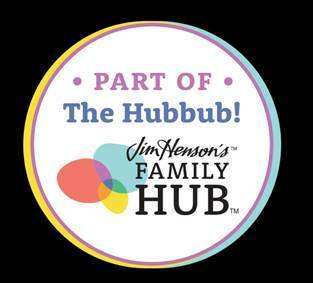 We love stuffed animals but as a mom I am always thinking where will we put another stuffie. For an adult it is the perfect bear. Cute enough to cuddle but not big enough to take up too much bed space. Goddess loved the Belgian Chocolates from Annalie's best. There were 4 of them and they were not only tasty but beautiful to look at. My favorites were the Chocolate Chip Cookies from Byrd's Famous Cookies. They were the perfect combination of buttery, chocolate chip cookies. Delicious. 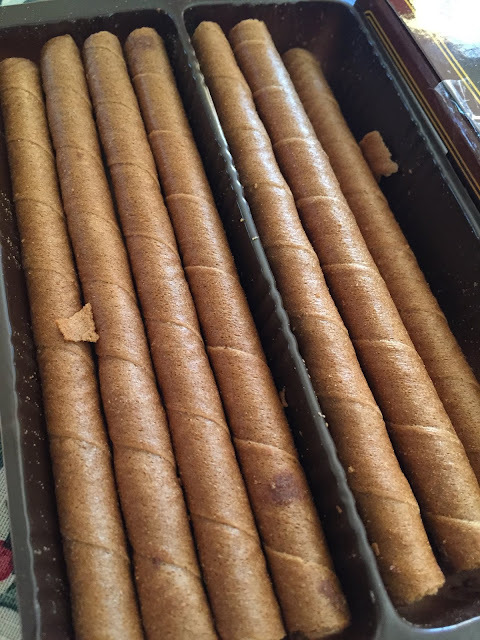 We also enjoyed the Wafer Rolls by Dolcetto with rich chocolate cream inside them. Goddess has asked that I put one in her lunch box as a treat this week. 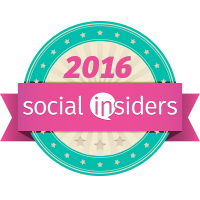 I put one in my lunch box this week too! The Chocolate Hazelnut Truffles were amazing. There was one for each of us. They were so good with a whole hazelnut in each. 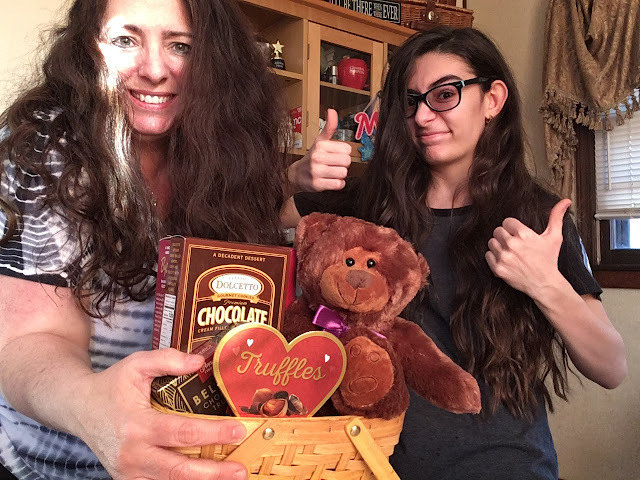 We will definitely, be mailing out one of these baskets and a Valentine's Day Cookie Cake to family out of town. I cannot wait to see what they have for Easter. Check out my unboxing and our Taste Test here.